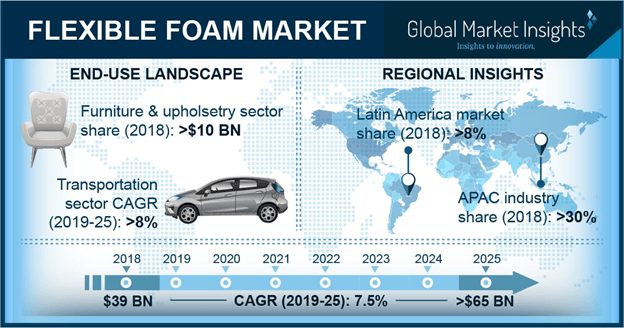 Flexible Foam Market size is estimated to surpass USD 65 billion by 2025; according to a new research report by Global Market Insights, Inc.
Strong outlook with versatile end-user applications including furniture & upholstery, packaging, construction, consumer goods, bedding, pillows, mattresses, carpet cushion, automotive interiors etc., are among key factors driving the flexible foam market growth. Features such as lightweight, high resiliency, durability, and improved safety & comfort will enhance the product scope in end-use applications. Shifting focus of the manufacturers towards development of products using bio-based materials will further stimulate the product demand. Growing demand for the product in furniture and upholstery applications to provide improved cushioning, low water absorption, good mechanical strength and absorption of static stress will enhance the market penetration. Favourable regulations provided by government bodies regarding the use of thermal insulation materials in the construction sector globally will fuel the industry expansion. For instance, the International Energy Conservation Code (IECC) has set a standard criterion to qualify in the national program through the construction of energy-efficient buildings with efficiency level between 40 to 50 percent compared to other houses. However, fluctuation of raw material costs and stringent regulations regarding the use of hazardous raw materials during the manufacturing of the product may hamper the demand. BASF, Covestro AG, Huntsman International, Dow Chemical Company and Recticel are among major flexible foam manufacturers. Global industry share is highly fragmented with the presence of multinational and regional players. The manufacturers are involved in production capacity expansions, mergers & acquisitions, and new product launches, to gain a competitive share. For instance, in October 2014, Sekisui Chemical announced to invest USD 3 million in the manufacturing facilities in Coldwater, Michigan to cater the growing demand from the North American market.